Darrel Franson has spent the past 15 years renovating his pastures with novel, nontoxic fescue. He’s been entering numbers into computer databases and spreadsheets for even longer. The proof is always in the data, and Darrel Franson has plenty of that. Franson, a beef producer from Mount Vernon, Mo., moved to the state from Minnesota in 1993. “My learning curve was nearly vertical,” said Franson, who spoke at the Novel Tall Fescue Renovation School in Columbia, Mo., in March. “Summer heat, pests, soil conditions, and toxic tall fescue were all new to me,” he added. These days, the outgoing Franson shares his successes, mistakes, and journey to grazing nontoxic, novel tall fescue with anyone who cares to listen. He backs his words up with a scroll, not of ancient writings, but of cattle performance data that stretches over 20 feet. Trained at the University of Minnesota, Franson was resolved to manage his cattle and grass when he arrived in Missouri. 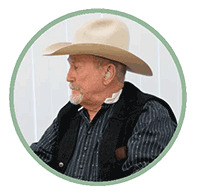 He initiated a managed grazing system in 1994, installed a water system, and built a cattle-handling facility. Everything was by the book, but there was still one problem — the cattle weren’t performing to expectations. The issues with grazing Kentucky 31 tall fescue, which contains an endophyte fungus that produces toxic ergot alkaloid compounds, are well documented: poor calf gains, shaggy hair coats, low conception rates, abortions, and loss of hooves, also known as “fescue foot.” Franson’s cattle exhibited all of these maladies. In 1994, there were few options to combat toxic tall fescue. It had been determined that endophyte-free varieties weren’t able to persist during the hot, dry southwest Missouri summers. “The only real option was to try and mitigate the toxin,” said Franson. The Minnesota native seeded lespedeza, red clover, and ladino clover in an effort to dilute the toxin. He managed the fescue to keep it vegetative, fed a medicated mineral mix, limited nitrogen applications, and started fall calving. His success in beating the toxin was moderate, at best. It was 2000 when Franson learned about Max-Q, a novel endophyte variety touted as having the fungus for persistence, but without the toxic endophyte. The self-proclaimed “numbers guy” researched the product for a full year. In 2001, he pulled his sprayer loaded with glyphosate across 10 acres and took the novel tall fescue plunge using the spray-smother-spray approach. After eliminating the old fescue over the course of the summer, he seeded the new novel variety in the fall. “I did the same thing in 2002 on 20 acres, then continued to renovate 10 to 20 acres at a time until 2009 when I killed the last of the Kentucky 31 on my owned land,” explained Franson. Some people just talk a good game, but Franson backs up his success renovating pastures with numbers . . . a lot of them. He has tracked performance of every animal for 22 years using computer-based databases and spreadsheets. Each calf has 31 data entries, while each cow is tracked with 29 metrics. “I spend an hour each week entering data and four to five times that looking at the records. I learn something new every time,” said Franson. It is with these same records that Franson is able to preach the virtues of novel tall fescue. He figures his renovation cost $200 per acre, or $304 per cow using his 1.52 acres per cow stocking rate. Since the novel tall fescue renovation, Franson has determined he’s gained $209 per cow in sales value. This added value has come from gains in weaning weight (plus 60 pounds), weaning percentage (plus 11 percent), and additional weight gain (plus 0.75 pound per day) for backgrounding and replacement heifers. “At my stocking rate, the payback on pasture conversion took about one and a half years,” noted Franson. When asked about his thoughts of selecting cattle with tolerance to toxic fescue, Franson said that he has been hesitant to do so. His focus remains on performance traits, which he doesn’t want to compromise. The Show-Me State cattleman serves on the board of the Alliance for Grassland Renewal (www.grasslandrenewal.org), an organization dedicated to renovating toxic tall fescue pastures throughout the U.S. Fescue Belt and ensuring the quality of novel endophyte seed. “I’d never want to go back to toxic fescue,” concluded Franson. This article appeared in the April/May 2016 issue of Hay & Forage Grower on page 8.